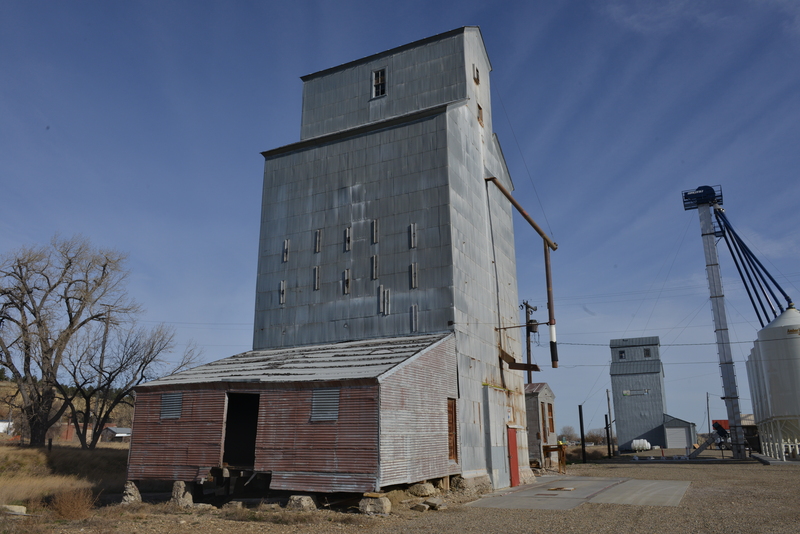 The search for our grandfathers’ elevators has led us to many small towns and many grain operations. Among our discoveries have been ancient wooden elevators, now quaint relics among their larger concrete cousins. In some towns, wooden elevators still have jobs to do, but their time is short. 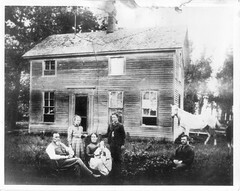 Charles H. Tillotson built wooden elevators long before his children took up the slip-formed concrete building technique, and at one time, every Midwestern town with a rail line had a row of them serving the local farmers. Now it is increasingly rare to find a town with more than one wooden elevator in service, or for that matter, still standing. 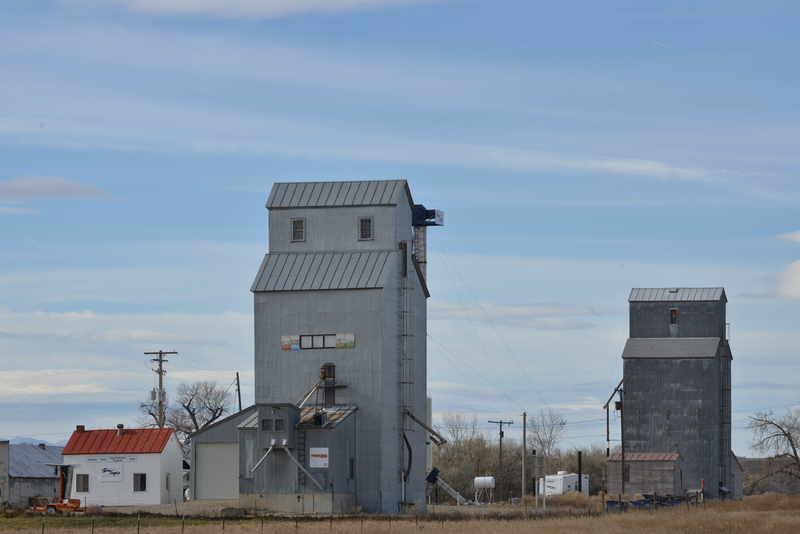 The Ryegate, Mont., elevator is flanked by its replacement fertilizer plant. In the last year or two, in several towns, locals have told me that their wooden elevators were no longer used and would shortly be destroyed. I made an extra effort to document those elevators. This week, I almost missed one. 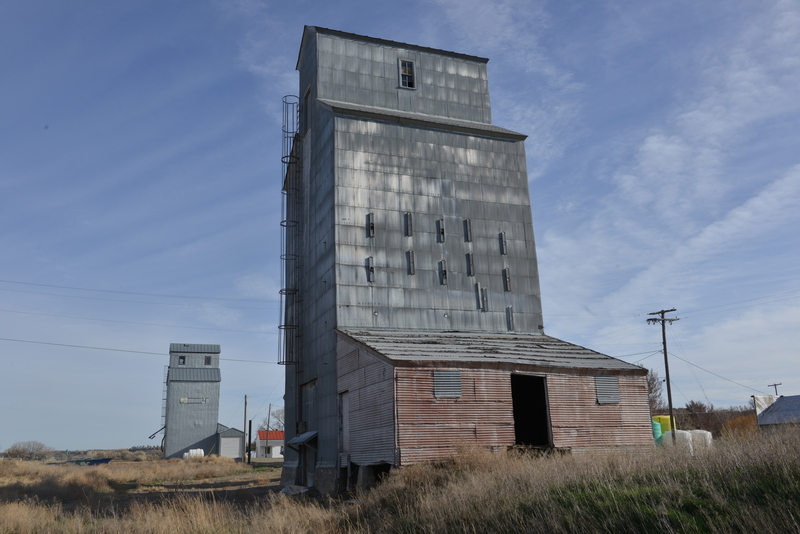 In Ryegate, Mont., a new fertilizer plant was put into operation last year, and the elevator that had served the purpose was now slated for destruction. When I stopped to photograph the pair of wooden elevators at Ryegate, a town on U.S. 12 in east-central Montana, I went into the local cafe for a burger. A fellow at the bar introduced himself as Ken. He wondered where my hometown was, and the purpose of my visit. When I told him I was a bit of an elevator tourist, he told me about the Ryegate elevators. Ken worked at the Ryegate facility. He said that over the years, he had been employed as a grain hauler and in almost every other aspect of elevator work. The smaller elevator was built in 1917. Ken said grain dropped 70 feet from the top of the grain spout to a truck below while loading. The elevator had been in use as recently as two years ago, then the new fertilizer plant was built nearby to replace it. 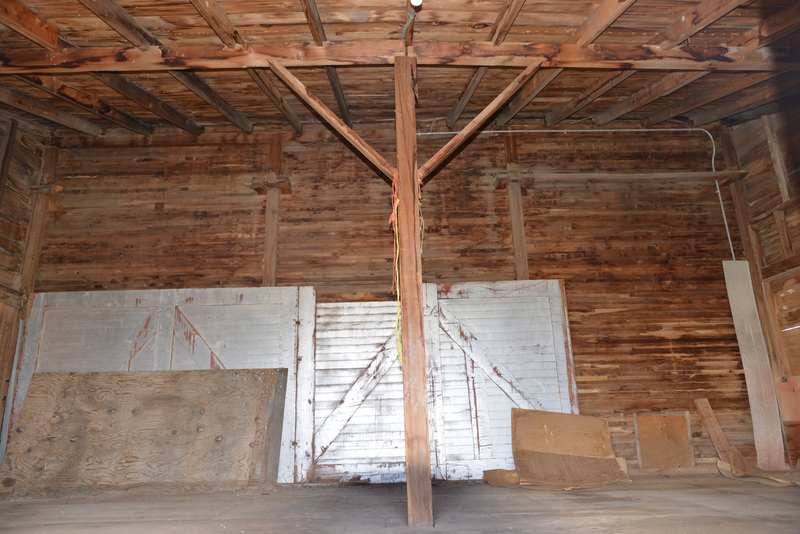 The larger elevator, built in 1914, was still used for storage—it had fresh siding and looked neat and clean on an immaculate lot. But the smaller elevator, equally handsome, would be razed next week. He hoped I would get out and take more pictures before it was gone. Our discussion ranged from elevators to the military. Ken served in the U.S. Army, had great admiration for the old C-130 aircraft, and expounded with enthusiasm about the M-1 Abrams tank and the Tow missile. He got a kick out of talking with another veteran who shared his interest. He also spoke with reverence about serving under President Ronald Reagan. The interior of the shed addition. Her announcement passed without any comment at the bar. Apparently, during deer season, such declarations are expected. Before I departed to take a closer look at the doomed elevator, Ken introduced himself more formally as Sgt. Ken Davis, and shook my hand. It was an honor to meet this veteran who served back when we had a 600-ship Navy (in the good old days, about three wars ago). As I took another circuit around the old elevator to shoot a few last pictures, the sun played on the high clouds, projecting light like a halo radiating about the old structure. I thought it a fitting farewell. In honor of Veterans Day, I salute Sgt. Davis and his life’s work. I hope he enjoys the pictures. 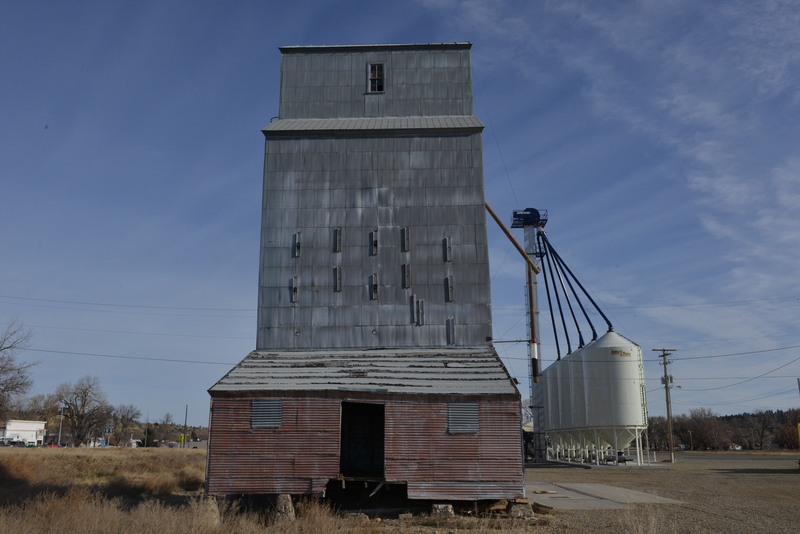 This entry was posted in Charles H. Tillotson, Miscellany and tagged architecture, construction, elevator demolition, grain elevator, photography, Ryegate Montana. Thanks for a post that celebrates our wood elevators and our veterans service to our country! I am the contactor who salvaged this particular elevator. While I dislike to see these prairie landmarks dissappear, I am one of the few contractors that try and preserve some of their memory by recycling as much of the wood and materials as possible. I understand the practical aspects of the matter. When I visited a few elevators during demolition, one of the most heartening aspects of the process, as it was explained to me, was the reuse of the wood. One in particular that was built in 1972 and torn down in 2013 was a boon to its owners because of the value they were able to get from selling the wood. What I hate to see is when the elevators go up in smoke. That seems to be a waste, though I’m sure there are some elevators beyond salvage. I have a number of high quality photos of the elevator you salvaged, and if any of the local employees would like me to send these last images, I would happily provide them. Thank you for your comment–your end of the story is a vital one, if bittersweet.